"Who needs alice anyway?" is a marvellous track that adds iem-flavors to something that's a little like top-of-the-pops-trance basis. This is Fun-Tourist's second milk-single following partly the same path as Face On/Take One (which has gained quite amounts of radio playing here in Finland by the way): both the melody and drums are on the same line competing to take over the tune. The first three minutes are totally built on playing with beats and loops. I think there's even a loop sampled from Alice Deejay along the vocoder-lines and Kraftwerk-like sequences. Fun-Tourist is a magnificent composer even seeing from the musically traditional point of view. In this genre of music (though I feel awkward when I say the word "genre") the rhythmitechnical side (the twisted beat experiments and tempo trickery explorations, you know what i'm talking about) often takes larger part of the tune leaving the melodic part more on the background. 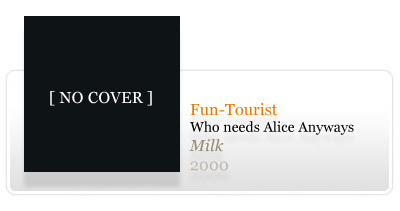 This isn't the case on Fun-Tourist's tunes despite the fact that the wicked beats and rhythmic effects are a major content in them - especially in the 3-minute intro of "Who needs alice anyway?". This tune is definitely composed with a smile on the face as after the intro of crazy re-triggering of drum loops with varying effects on them the tempo rises and a whole other tune merges from this: an ultimate rave track. Or that's what i thought to myself when I first heard this tune at the Koneisto-festival last summer. I've never got myself that swetty raving to a tune. Anyway, after the rave part the tune gets all wicked and twisted again as the drums eat themself with the rhythmic trickery and some melodies stay to play fading the track away. A magnificent, hardly categorisable track both for party and listening. cá para mim enganaste-te no post em que deixaste o comentário, não? é só uma musica..